Lintbells, manufacturers of pet joint supplement YuMOVE, have always emphasised the importance of maintaining a healthy and happy lifestyle. The brand urges dog owners everywhere not to let the colder weather freeze up your exercise routine and has put together a few fun outdoor activities for you and your pet to enjoy. With the crisp weather and beautifully coloured leaves, autumn is a perfect time of year to enjoy the great outdoors with your pup. Taking your dog on a hike can be a great way to enjoy the foliage and have a really fun day out with your furry friend. Be sure to check with a vet on your dogs’ fitness and mobility levels before choosing your hiking route, wrap up warm and always take plenty of water with you. You can find the best dog walks and parks local to you by visiting the official government and National Trust websites. At this time of year, we’re all raking up those yellow, brown and orange leaves into a big pile, to usually put into our compost bins. 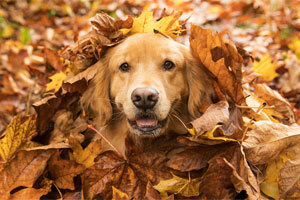 Why not leave them out for a little while longer and let your dog play with the foliage? They’ll love the opportunity to create such a colourful and lovely mess in the garden. It’s such a great sight and you will definitely create some truly instagrammable moments! At this time of year, most of the popular beaches around the country once again open up their sandy shores. Whilst it may be a little chilly in autumn, a walk along the beach during this time is sure to get your blood pumping and is a fantastic source of exercise for both you and your pooch. If you don’t live near the coast, taking your dog to new areas and terrains can be a great way to acclimatise them to change and visiting new places. Who doesn’t love a little splash in the sea once in a while? Be sure to check prior to visiting any beach that dogs are permitted and remember to pack some fresh water with you – even though it’s not too hot for your dog they may get thirsty and we don’t want them drinking any sea-water! Going to the beach is also a great opportunity for the whole family to enjoy themselves. Why not go crabbing? Or visit a pier or seaside fair which can be a lovely family activity. After a long and cold walk, nothing can beat cosying up in a pet friendly pub, around a warm fireplace with a drink for you and your furry friend (dog friendly for your pup of course!). There are plenty of dog friendly pubs around the country for you to enjoy together with some great food, a pint and your dog at your feet. Some pubs might even have a dog menu and doggie beer for your pooch to indulge in! There are a number of useful websites that you can use to find the best dog friendly pubs near you. The colder months can bring about stiff and achy joints for both humans and our four-legged friends, so it’s important to keep both yourself and your dog active and healthy at this time. To make sure that your pet pooch is armed with the right ingredients that keep him/her happy and healthy why not support their diet with a natural supplement? Lintbells’ YuMOVE PLUS is designed to give extra joint support to dogs, especially those who are experiencing extra stiffness during the winter. It’s packed with unique ActivEase® Green Lipped Mussel and full of anti-oxidants to aid joint development, support active joints and structure, and promote mobility. The premium YuMOVE PLUS formula is clinically proven to work within six weeks* and can make a tail-wagging difference to your pet pooch. YuMOVE is now the official sponsor for ITV’s viewer favourite, “For the Love of Dogs”, on every Wednesday from 8pm on ITV. For more information about Lintbells please visit www.lintbells.com or to speak to a member of the Lintbells team please call 01462 416866.